With its 1,024-ways-to-win betting system and a nice horror theme, it’s probably appropriate I’m reviewing this game around Halloween time. 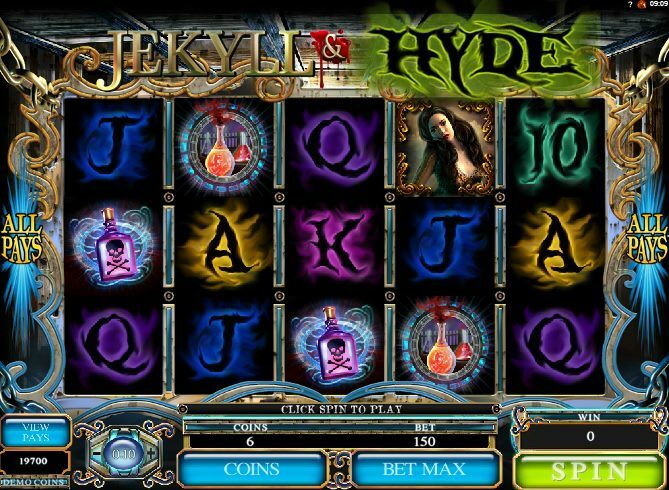 Online casino slot game developer Microgaming’s Jekyll and Hyde borrows from the classic Victorian story by Robert Louis Stevenson of a doctor hunting for the best spot cream* but accidentally inventing a potion so deadly it makes him turn into a hideous alter ego – Mr. Hyde. On the reels are featured plenty of relevant symbols: the good doctor himself, the girl he loves, potions galore, and spooky-looking 9-through-Ace symbols. The symbols alone deliver the Gothic theme that is ever-present in this slot with the eerie mist that surrounds them. The ‘Wild’ icon substitutes for all regular symbols other than the Scattered Jekyll and Hyde logo. Three Scatters triggers 10 free spins straight away, but here’s the twist: when Dr. Jekyll - here looking like Hugh Jackman drawn by a 12-year-old - appears during free spins, he transforms into Mr. Hyde to award even bigger wins. 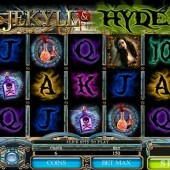 Five Mr. Hydes across the reels will bag you a 7,500-coin jackpot. While Jekyll and Hyde won’t exactly win many awards for its graphics or animation (it really does look like Hugh Jackman drawn by a 12-year-old) and the music is a bit weak, the neat ‘transforming’ Wild symbol appeals, particularly if you’ve played Ash Gaming’s cracking horror-themed Full Moon Fortunes. In that game, based on the classic legend of werewolves, a moon icon cleverly turns the hero into a bonus-winning werewolf. Microgaming have some previous in this genre, of course. Immortal Romance, their multi-layered vampire-themed slot has drama, atmosphere, cute graphics and plenty of nice bonus feature rounds. For fans of Gothic Horror, you won’t go too far wrong with that game. *I think it was a spot cream. I can’t guarantee that.